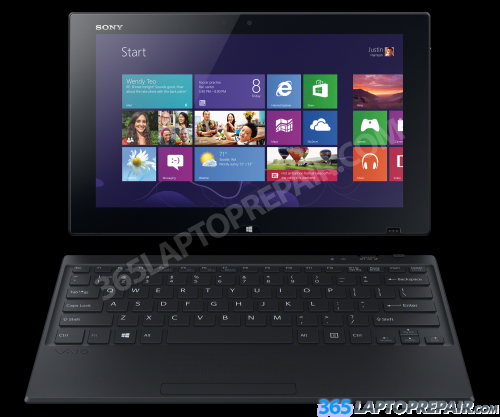 Get your Sony Vaio Tap 11 Fixed here! Purchase the Sony Tap 11 Screen Replacement part only for $149 and do the repair yourself! Check out our screen replacement tutorial that will help you do the repair! The model number for this laptop is SVT112A2WL. The product name is SVT11213CXB. Are you ready to start you repair and get your Sony Vaio Tap 11 fixed fast? Click the add to cart button below to begin the checkout process, we accept credit cards and PayPal. We offer many shipping options to and from our warehouse. You can pack your laptop and ship it to us yourself, or we can send you a pre-paid shipping label and a safe ship box to ship your laptop quickly, easily and safely! The Sony Tap 11 comes with a 128 GB Solid State hard drive (SSD). The Sony Tap 11 comes stock with 4 GB. It cannot be upgraded any further because it is integrated into the board and cannot be removed.